This is the first in a series of blog posts discussing some tips and ideas related very specifically to taking photos professionally. This is actually a very different concept to just taking good looking photos – I hope why it’s so different will become clear as we go along. These tips mostly won’t be camera tricks or photoshop techniques, but things which are more subtle, less often discussed and probably more important. And also pretty simple! A lot of the photos I and most other professionals are paid to take are actually fairly mundane. No one would look at them and say “Wow that’s an amazing shot!” Instead the pictures are required to be functional, to serve a specific purpose and be taken under very specific conditions. If someone is asked for their “10 best photos”, the photos _should_ be pretty good, because in the phrase “10 best photos” there are no constraints on time, location or subject matter. A picture of a gorgeous sunset, a heart-wrenching Indian beggar or a beautiful girl looking beautiful are actually pretty easy to take if they happen to be things you’ve encountered in your life over however many years you’ve been using a camera. A photo of person X, visually illustrating concept Y, taken at location Z and time T is much, much harder to do and often requires a lot more skill – although the end result may be a lot less flashy! 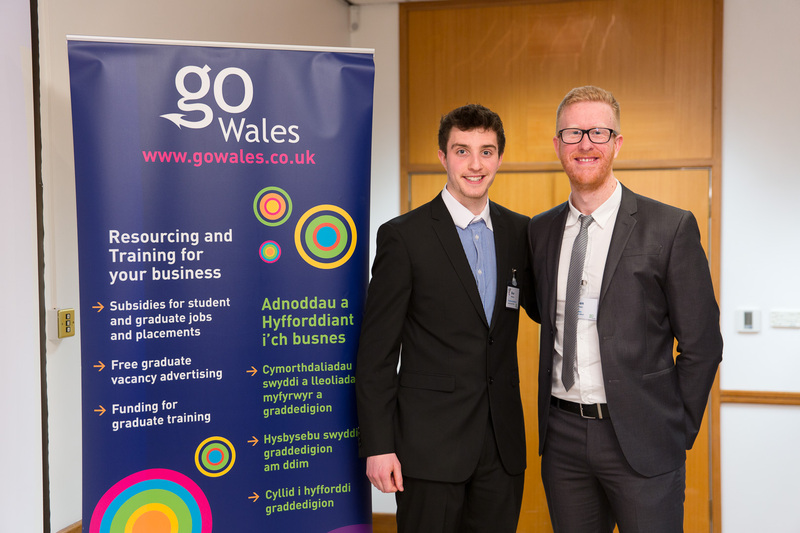 I was shooting a business event for GO Wales and afterwards I was asked to take a photo of two of the attendees to be sent out with a press release. The resulting image is anything but flashy but even something this simple actually requires some thought and technical skill. Okay that one’s easy, just photograph the right people! This could be a difficult requirement and here I’ve met it with a really common to the point of boredom solution i.e. stand them next to the event organiser’s banner. This kind of photo is very, very common, but it’s common because it works and it’s hard to think of practical alternatives. 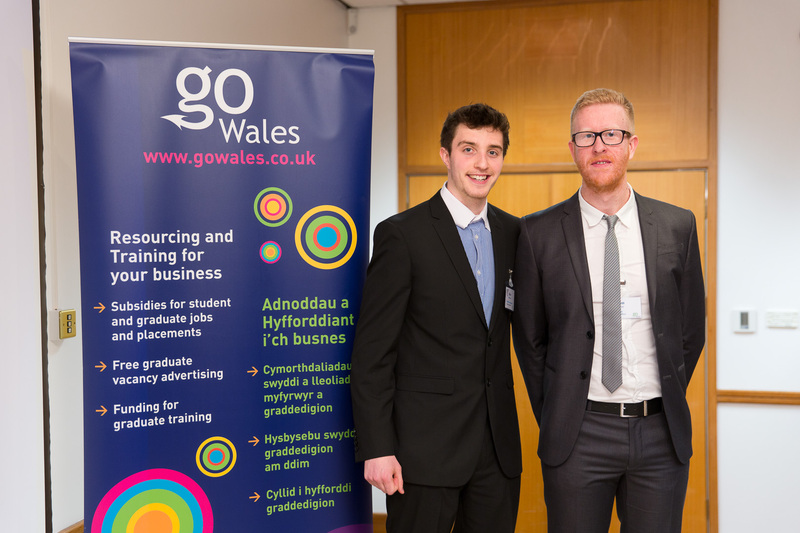 Just by looking at the photo you can tell that the two guys are probably at an event put on by GO Wales or are somehow related to that organisation, and you can tell GO Wales has something to do with training, business and students. Without the banner it would just be a photo of two random men stood next to each other. 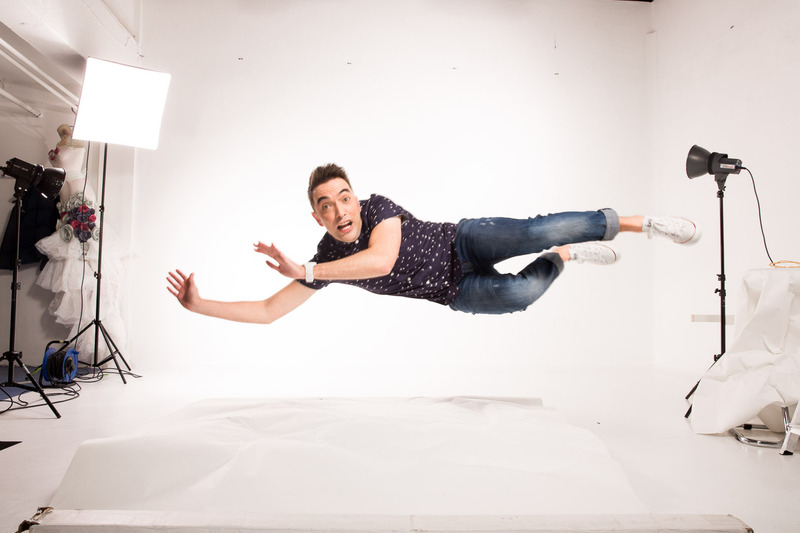 This is because of all the other images I was required to get, and the subjects themselves had other things to do. This means no time to set up lights, no time to try multiple things, I have to set something up myself and make it happen rather than just wait for it to happen. We’re in a small conference centre, it’s raining outside, the delegates don’t want to leave and I can’t leave in case I miss any of the event. The photo must be well exposed, the colors must be good, not blurry or noisy and suitable for intended output, which in this case is the web and news print. The picture must clearly show the subjects without too much distraction, for example a cluttered or irrelevant background. I was only explicitly told it had to be a photo of the two people. The other requirements I added myself because I know from experience that they’re necessary. Clients are getting me to do a job so they can take advantage of my knowledge and skill, and part of that is me knowing what’s required. The equipment you use, camera settings and editing are far less important than what’s happening in front of the camera. The second photo is MUCH better than the first one. The composition, lighting, camera settings etc are almost exactly the same for both, but the second picture is much more appealing and more importantly much better meets its requirements than the first – purely because of the expression on the face and the body language of the guy on the right. No amount of photoshop could make the first image as good as the second, nor would it make any different if I’d used the world’s most expensive camera. In the first photo the guy on the right looks apprehensive, confused and as if he doesn’t want to be there. 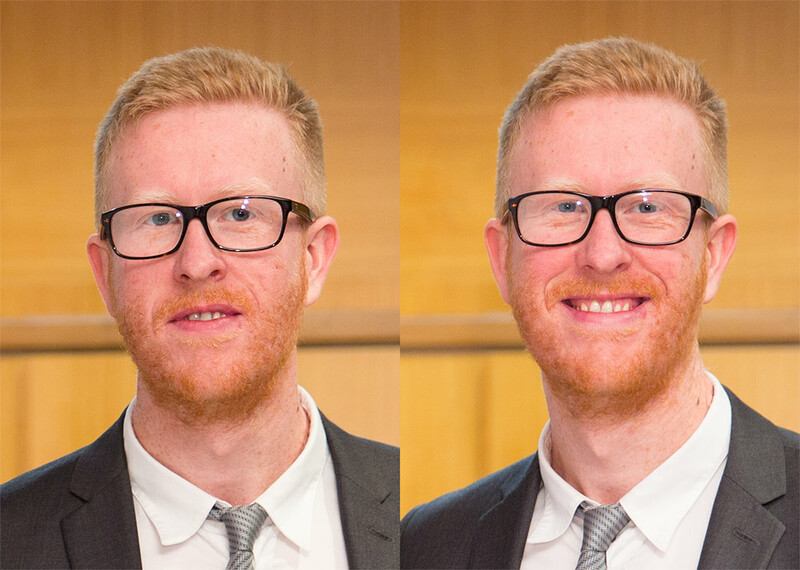 In the second picture he’s happy, relaxed, friendly and approachable – exactly the qualities the company he works for want to demonstrate. As a side note, the guy on the left looks a bit slimmer in the second photo because of the gap between his right arm and body. Is his smile better in the first photo? Maybe, and I could always photoshop his head from the first photo onto the second to take the best elements of each… but that’s another Pro Tip.